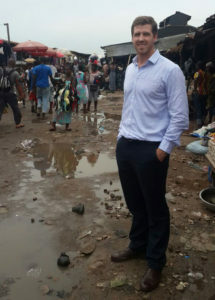 Visiting a market in Accra, while in town to meet with Accion’s partner institutions. While on a recent trip to Accra to work with an incumbent lender to digitize their product offering, I was not surprised to hear the CEO ask whether he should go “fully digital” and discard the idea of investing in branches. Based on the hype out there, it’s understandable — businesses such as Tala in Kenya and Wema Bank’s ALAT have designed business models that are void of physical contact without the need to ever walk into a branch. But do I believe that traditional financial services providers should aspire to transform to the fully digital model? Not at all. While digitization is inevitable for “traditional lenders” to remain competitive in the ever-changing landscape, exclusively digital business models do not allow microfinance institutions to leverage some of their strongest assets. These strengths include their existing branch network, the ability to understand and engage directly with their customers, and a brand that is trusted and regionally relevant due to a legacy of high touch engagement. For these traditional lenders in emerging markets, going “digital” is often merely perceived as a channel play, serving existing products through digital channels (as opposed to designing new products that are premised off fully digital business models). Digitization can enable expansion into rural locations where serving new customers with brick and mortar distribution wouldn’t be feasible. But it’s not always that simple — customers in these rural areas may still need physical interaction due to lack of digital access (infrastructural constraints) or to gain comfort with digital products (cultural constraints). A good example here would be to compare lending models between emerging market online lender Kreditech, which employs an entirely digital lending model, and Oakam, which uses a more balanced tech and touch strategy. Kreditech targets underbanked customers — those who may have a bank account but limited access to credit or customized products that meet their specific needs. Their online, non-physical business model means that they are typically unable to target unbanked customers at the bottom of the pyramid, where lack of online access may restrict the delivery of digital products. In comparison, Oakam targets migrants in the UK who have no credit history and are often wholly unbanked. Their customer engagement is digitally-focused (even financially excluded customers in the UK have smartphones! ), but they have also set up a number of physical branches to engage with customers and educate them on their financial journey. This physical touch point is also used as an opportunity to learn more about customers, which provides data beyond what a credit report might show for customers who’ve never had a chance to establish a financial history for themselves. Oakam’s physical branch network has proven pivotal in its ability to serve financially excluded, often financially illiterate, customers. This example illustrates the value of a physical touch point to acquire customers and build trust where financial literacy or trust is low. Customers’ ability to use the product: The adoption of digital credit may be limited by gating constraints such as affordability of data, poor connectivity, and low smartphone penetration. These are classic examples where the delivery of digital financial services requires a more physical medium of delivery. Furthermore, physical engagement may be required to educate customers and build trust before they are willing to open an account or take out a loan, digital or not. Customers’ “digital savviness”: Recent research by CFI revealed that financially unserved customers, when engaging with providers of financial services, strongly prefer face-to-face interactions for establishing mutual legitimacy or resolving problems. I’ve seen this first-hand when launching digital financial services in several African countries. Many people who have never used a formal financial product want the comfort of a face-to-face discussion — not only to understand the product but also to trust the provider of the product (I have personally been accused before of being a 419 scam!). The size of the loan: Different digital lending products require different touch strategies. Short term nano-loans, which are often used for consumption purposes and typically have higher default rates, require scale for the lender to drive profitability; to achieve this scale, the lender can’t afford to have a high touch model. But larger loans, such as SME loans, which concentrate the risk for the lender, may require additional physical checks, even in highly digitized processes. Creditas, a mortgage and car loan origination platform in Brazil, employs a fully digital customer journey but still uses partners to assess assets, as lenders will pursue full legal recourse in the event of default. In comparison, digital nano-loan lenders such as Jumo or CBA (MShwari, MoKash) will simply write off defaulted loans. The lender’s current distribution: An existing, efficiently-run branch network would provide a competitive advantage in any of the above cases. In these instances, immediate disinvestment may be detrimental to the business’s growth or relationships with customers. However, lenders faced with building their branch infrastructure from a low base will naturally look to the efficiencies of digital engagement. The key to going digital is for customer engagement always to remain human and for lenders to design an intuitive customer journey that maintains established relationships and trust, yet balances digital and physical engagement. Over time this will involve a less physical involvement. However, a strategically placed physical presence will continue to play an important role in helping financial services providers serve emerging markets.